On Sunday, February 19th at 4:00 PM there will be a Service of Remembrance and Action at Second Baptist Church located at 609 North Rose St, across from Metro Transit in downtown Kalamazoo, to remember those in our area who have died by firearms. If your family has experienced the tragedy and grief of a firearms death, you are especially invited and encouraged to participate in the Service of Remembrance, to share a name and photo of your loved one. Pastor Michael Thomas Scott of Galilee Baptist Church will deliver the Message. Following the service at approximately 5pm, there will be a 30 minute firearms safety workshop offered through MOMS Demand Action for Gun Sense, Kalamazoo Area. This workshop is intended to help all of us become advocates for the safety of children, youth and adults. 2016 was another year of firearms violence causing injuries and deaths in Kalamazoo County, Michigan and the nation. Survivors of firearms violence suffer the aftereffects, mentally and physically, for years to come. According to the Centers for Disease Control, more than 90 people, including a number of children, die from firearms violence in the United States every day, more than 58 of them by suicide. It is time for the deaths of family members and residents of our own area to be remembered and for a face to be put on the tragedy of firearms violence in our region and in the United States today. 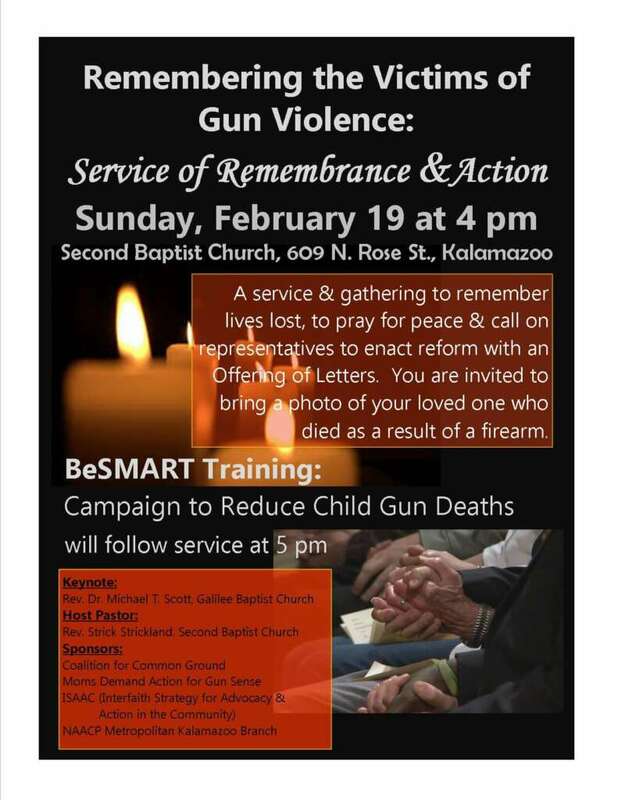 Sponsors of the Service are: Coalition for Common Ground: Reducing Gun Violence Together and MOMS Demand Action, Kalamazoo, along with co-sponsors ISAAC and the NAACP Metropolitan Kalamazoo Branch.